GM profits on Thursday posted a higher-than-expected quarterly profit on strong demand in North America and cost-cutting in its struggling European business. Europe, where industry sales hit a 20-year low in the first half, remains “very challenging,” GM Chief Financial Officer Dan Ammann told reporters. He added it was too soon to call any sort of improvement there. GM’s net income in the second quarter fell to $1.2 billion million, or 75 cents a share, from $1.5 million, or 90 cents a share, a year earlier. Excluding one-time items, mostly related to the acquisition of preferred shares in GM Korea, the automaker earned 84 cents a share, 9 cents above the average forecast of analysts polled by Thomson Reuters I/B/E/S. GM shares were up 2 percent in premarket trading. Revenue rose 4 percent to $39.1 billion, above the $38.37 billion analysts had expected. In May GM reported a stronger-than-expected first-quarter profit as it kept a tight grip on costs in its North American and European businesses. That grip was still in place in the second quarter in Europe, where the company cut $400 million in costs compared with a year earlier. Ammann said GM continues to be aggressive in those efforts. GM’s North American business had operating earnings of almost $2 billion in the latest quarter, easily topping the $1.75 billion that nine analysts polled by Reuters had expected. Ammann said the U.S. market remains robust, but GM declined to raise its full-year forecast for industry-wide U.S. sales. GM Europe had an operating loss of $110 million in the second quarter, almost one-third smaller than Wall Street had expected. The company’s sales and market share in Europe fell in the quarter, however. Ammann said GM remains focused on executing plans previously outlined in its alliance with PSA Peugeot Citroen (UG.PA) but has no plans to put more money into the French automaker. GM’s international operations, which includes China, reported a disappointing profit of $228 million, down 64 percent. Ammann cited pricing pressure in Australia and Southeast Asia, as well as cost headwinds in India. 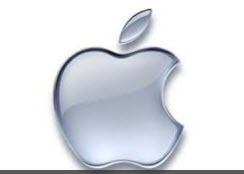 Apple (AAPL) apple earnings released its earnings for the June quarter. These were slightly higher than consensus estimates both for revenues and EPS. 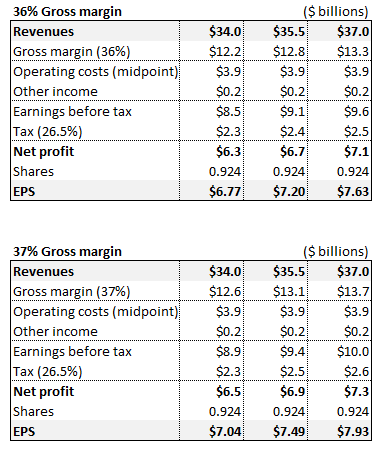 Revenues came in at $35.3 billion vs. $35.01 billion expected and EPS came in at $7.47 vs. $7.32 expected. A range of $34 to $37 billion has a midpoint of $35.5 billion. Market consensus was for $37.11 billion, so any of these levels represents a miss even at the high end of guidance. At $35.5 billion, revenues would be 4.3% below expectations — at the midpoint. At the high end of the range revenues would hardly miss the present expectation. This is better than last quarter in the sense that last quarter the midpoint guidance implied a 12.3% miss and the high end of guidance implied a 9.8% miss. While this guidance still implies a bit of downward revision, the market liked it during the after-hours session. Year-ago revenues for the September quarter were $35.97 billion, so just meeting the midpoint of guidance would imply decreasing revenues. At the high end of guidance there would still be a bit of revenue growth. As we can see, the guidance implies EPS between $6.77 and $7.93. Also relevant, during the March quarter Apple came in at $7.42, near the $7.46 top of the range I estimated. Thus we could conceivably expect that Apple is not going to come far from the top of the guidance this time either ($7.93). These estimates compare to the existing consensus of $7.96, which saw a significant downward revision in this last week. If we were to just compare this range of estimates to the $7.96 consensus, the downside would be between 0.4% and 14.9%. Last quarter the downside was between 18% and 27%. But as I said, Apple came in at the top of the estimated range, and if it does it again, then there’s nearly no downside to the current earnings consensus. It is probably this that’s helping Apple shares in the after-hours session. Finally, this estimate range implies a drop in earnings from 2012 of between 8.7% and 22.1%. Thus, while Apple is celebrating in the after-hours session, it probably won’t go too far. Apple used to exceed its earnings guidance considerably. Now it seems to be targeting a realistic range, though as we’ve seen it still came in near the top end. I had called attention to this change in my previous article on Apple’s guidance, and it probably remains true for this quarter as well. Apple’s guidance for the September quarter — while not fantastic — seemed to allay fears that it would again be disastrous. At the top of the estimate range the earnings guidance implies almost no downward revision to estimates, even if again, it also implies earnings which will trail 2012s. At least this guidance once again puts the spotlight on the new products that are supposed to be announced at the end of September. With Apple’s low valuation and the prospect of new product launches coming up, this guidance is mildly positive. Ignore Apple’s earnings announcement slated for July 23, after the close. Ignore the fear. Ignore the hysteria from the unspeakably ignorant pundits seeking free coffee in the waiting room at CNBC. And ignore traders. Please, ignore traders. I am oh so tired of traders. If you are, life – your money management life – should be simple. Buy Apple. Sell some calls and, metaphorically speaking, go home. Do it every week or every month or every quarter. Use Apple as a basis for a 15% or more yield – from selling calls – and watch the stock appreciate, it will. I refuse to say it must despite the temptation. Apple sells at a 50% discount to the S&P 500. On the surface the stock sells a bit shy of 10 times next year’s earnings. Take out the cash on its balance sheet – more than $150 a share – and the stock sells for six times earnings, Seems immoral doesn’t it? Apple has almost as much cash as S&P 499 – the rest of the S&P 500. Apple sales are growing four to five times faster than the average S&P 500 company. It is not Microsoft redux – it faces growing markets with very innovative products, right now it is simply more expensive than many of their competitors, a voluntary choice to maintain margins triple that of many competitors. Speaking of margins – Apple’s profit growth is four to five times faster than the average S&P 500 company. Apple stock faces only upside catalysts – potential dividend increases, potential stock buy backs, potential market share gains, potential new product announcements. That is the financial perspective. How about in the real world? According to ChangeWave Research (part of the 451 Group), the iPhone is picking up considerable market share and this is in light of a potential iPhone upgrade – a major upgrade – later this year. I am typing this on my new Mac Air. I am kind of cheap. My old laptop surrendered to age the ability to hold a charge. I looked at the alternatives and bought this Air. Took five minutes to buy, five seconds to register. An Apple experience. Customers agree and the iPhone, the iPad and the Mac product line are all at the very top of customer rankings in their respective markets. Apple has purposely chosen to give up potential share to maintain margins. Other than memory costs Apple is looking at a favorable production cost curve and this means a lower cost set of products, and a lower price set of products, in the next 3-18 months. The first possibility is a deal with China Mobile, vendor to more than 625 million (million with an m, not thousands with a t) customers. Is Netflix (NFLX) a house of cards? The stock has certainly seen dramatic swings, dropping from the $300 range in 2011 all the way to $50 or so before bouncing back to over $250 recently. There is no doubt that this company has made headlines in the relatively short period since its initial public offering in 2002. In barely a decade, it went from unknown to household favorite with its movies-on-demand streaming subscription service propelled in part by the parallel success of the iPad and Android devices and its service has become standard fare for consumers and commuters needing some distraction without having to go out to the cinema. With a market capitalization of some $15 billion, it had made founder Reed Hastings a lot of money not to mention those fortunate enough to be long or short at the right time in its short history. Speaking of “short history,” it has also been a favorite of short sellers with just over 7 million of its 56 million shares outstanding sold short. Options traders love the stock as well, particularly option sellers who can coin juicy premiums if they can time their sales to avoid some of the many adverse swings that have left more than one trader in tears. The company’s fundamentals tell part of the story. Sporting a price to earnings multiple of over 600 times and living in the rarefied atmosphere of high tech darlings, it is a stock not for the faint of heart regardless of their bull or bear leaning. No one should be surprised that Netflix does not pay a dividend. With earnings per share of $0.41 in the past 12 months and a stock price of $265 per share, a dividend would look like a rounding error. Book value of about $15 a share provides not much in the way of tangible asset value to support the share price and, surprisingly for a stock where the market has been willing to pay an enormous premium for shares (making the cost of equity capital pretty low), the company has $700 million long-term debt sitting on just over $800 million book value of equity. Does anyone smell an issue here? It is plain and obvious that Netflix bulls are betting big time that the company will grow sales and profits quite dramatically for an extended period of time to grow into its valuation. Insiders, reluctant to wait I guess, have been sellers. Netflix might be worth $265 a share if it had a quasi-monopoly on streaming video entertainment, but of course there are other players in this game – Amazon (AMZN), YouTube, and Hulu to pick three – and over time we can expect Apple (AAPL) to continue to expand its iTunes service to an offering as broad and deep as that of Netflix. On the other hand, Netflix seems to have been successful in attracting former Pay TV subscribers who have shifted to Netflix and cut the cord on Pay TV. This together with innovative and exclusive content such as “House of Cards” and the company’s heady growth make up the bull case and the risks to short sellers. In my view, all of this adds up to a pretty good short, not without risk, and possibly a crowded trade. A better way to get short is probably to buy in the money puts to keep the premiums as low as possible and maybe a put spread. The benefit of the puts is the limited losses if it turns out the bulls are right and the freedom from any short squeeze should the stock have a rapid rise. I don’t have a position in NFLX, but by the end of Monday’s trade, I will be exposed on the short side one way or another. I think the earnings release due out after the close Monday will be a catalyst for a sizeable move on the stock and my bet is that it will be down. The market has not been kind to companies that miss expectations. Google and Microsoftboth missed expectations, and in each case, their stock dropped sharply after their recent quarterly releases. At over 600 times earnings and trading at over 100 times trailing twelve months EBITDA, Netlflix is expensive by any traditional measure. Netflix’s price to earnings growth multiple of 5.25 is at a nosebleed level when compared to 2.01 for the market at large (Source: First Call). Multiples at these levels imply extraordinary earnings growth expectations which certainly applies to Netflix, with First Call consensus expectations for $0.40 per share net income for the quarter versus $0.11 last year, or a 263% increase, and full year earnings of $1.40 versus $0.29 last year. Extraordinary is possible but unlikely in my view. I will be on the short side of the stock for a trade on the earnings report by buying puts if I can buy them at a premium I can stand. Will China supplant the United States as the world’s leading superpower and top player in the world economy? A new Pew Research Center survey of 38,000 people in 39 countries found the widespread belief that China is well on its way. Overall, a majority or plurality of respondents in only six of the countries surveyed believe the U.S. will remain on top. In both the United States and China, an increasing number of respondents agree with this thesis. Two out of three Chinese now predict their country will overtake the U.S., an eight percentage point increase since 2008. The number of Americans who agree has jumped 11 percentage points to 47%. When it comes to pure economics, the survey suggests that some people even think that China is already ahead of the U.S.
By almost any statistical measure, the U.S. economy is still top dog. But the perception that China has already built the world’s most powerful economy reflects the tremendous gains that have resulted from sustained 10% GDP growth over the past three decades. The survey also indicates that countries around the world have divergent views of the U.S. and China. The U.S. retains a higher overall approval rating, with 63% of people around the world having a favorable view of America. China’s rating is marginally lower at 50%. Pew isn’t the only group interested in the implications of China’s growing power. The Middle Kingdom’s increasing influence has also attracted plenty of predictions in Washington. The U.S. National Intelligence Council released a report last year that offers a series of prognostications about how the world might change in coming decades. One of its attention-grabbing assertions: China’s economy will surpass that of the U.S. by 2030. “China alone will probably have the largest economy, surpassing that of the United States a few years before 2030,” the report said. U.S. homebuilders are feeling more optimistic about their home sales prospects than they have in more than seven years, a trend that suggests home construction will accelerate in coming months. The National Association of Home Builders/Wells Fargo builder sentiment index jumped to 57 this month from 51 in June. A reading above 50 indicates more builders view sales conditions as good, rather than poor. The index hasn’t been that high since January 2006, well before the housing market crashed. Measures of customer traffic, current sales conditions and builders’ outlook for single-family home sales over the next six months vaulted to their highest levels in at least seven years. Steady job growth, low mortgage rates, rising home prices and tight supplies of homes for sale have supported a recovery in housing this year. NEW YORK (MarketWatch) — Two of the country’s biggest banks, J.P. Morgan Chase and Wells Fargo, are expected to report rising profits on Friday as they kick off earnings season for the financial sector. Long considered the bellwether for its broad reach, J.P. Morgan’s (NYSE:JPM) results will signal buoyant capital markets activity, and growing fees, for big banks, say analysts. Wells Fargo (NYSE:WFC) , the country’s biggest mortgage originator, will give a wider picture in terms of lending profits for the industry. While analysts acknowledge that the environment remains challenging, expectations are that it will be a respectable quarter from the banks. The financials sector is predicted to have the highest earnings growth rate, at 16.8%, of any sector for the second consecutive quarter in the S&P 500, according to analysts at FactSet. “We expect the capital markets sensitive banks to fare a bit better than the regional players given some support from improved core trading and investment banking results,” said Moshe Orenbuch, analyst at Credit Suisse, in a research report. Bank of the Ozarks is down after hours on its quarterly earnings report. New data out on European industrial production. J.P. Morgan and Wells Fargo will kick off bank earnings season before the bell. Victor Reklaitis has all you need to know about the next 24 hours in markets. The market has already warmed to the two giants — shares for both stocks have seen major moves in the first half of 2013, up more than 24% year-to-date through Monday. The J.P. Morgan gains in particular have come despite the firm being under intense shareholder and public scrutiny over the dual roles of Chief Executive and Chairman Jamie Dimon. Analysts want to know if second-quarter earnings growth can be sustained. Analysts expect the firm to report a profit of $5.6 billion or $1.44 per share for the second quarter, compared to $4.96 billion or $1.21 per share in the year-earlier period. 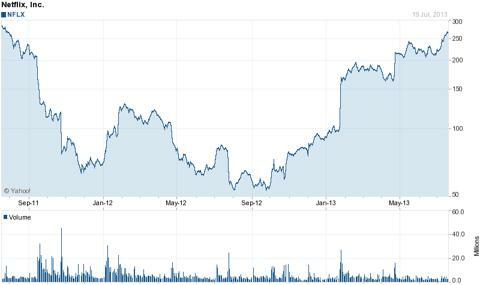 The company is expected to report revenue of $24.96 billion, compared to $22.18 billion in the second quarter of 2012. It’s been a good year for J.P. Morgan and Wells Fargo shares. The recent market sell-off driven by an increase in rates in Treasury bonds could be positive for the firm’s fixed-income business, according to analysts. The outlook by the firm for the mergers and acquisition and underwriting business will be key, given the sluggishness in the second quarter. Lower credit losses and the release of credit reserves will be positive news. “We expect mortgage credit to get better,” said Harte. Bank of America Merrill Lynch analysts say the headwinds to watch out for the firm are a longer-than-expected low interest rate environment, a worsening of the European sovereign crisis, and further regulation and scrutiny of the financial industry. Going into the next quarter, Bank of America analysts recommend bank stocks, including J.P. Morgan, with defensible revenue trends and the least likely to have earnings per share revised downwards. J.P. Morgan’s price target remains at $57 a share for the analysts. Wells Fargo is considered by many analysts as a super regional bank with its massive portfolio of loan originations, which are approximately a third of the total market share in the U.S.
“Wells Fargo’s quarterly earnings are not subject to swings in capital markets activities as some of the other bigger banks,” said David Hilder, analyst at Drexel Hamilton. Up to 30% of Wells Fargo’s total non-interest income comes from mortgage banking revenue, but with higher interest rates in recent months, there are concerns that revenues will be down for the second quarter compared to the first quarter, from lower refinancing. Another concern for analysts is the firm’s net interest margin, the difference between what the bank earns on loans and what it pays depositors. The capital markets and investment banking arm, approximately 30% of the non-interest income for the bank, is expected to be strong by analysts, given the run-up in the stock market. Wells Fargo is expected to report net income of $4.98 billion, compared with $4.4 billion the year before. The firm is expected to report a profit of 92 cents per share, according to analysts surveyed by FactSet, compared to 82 cents for the same period the year before. The country’s biggest mortgage lender is expect to report revenue of $21.17 billion for the first-quarter, compared with $21.28 billion the year earlier. The Federal Reserve will not be in a hurry to raise short-term interest rates, even after the unemployment rate comes down markedly, Chairman Ben Bernanke said Wednesday. The Fed has set an unemployment rate threshold of 6.5% for the first rate hike from the current near-zero levels that have been in place since December 2008. The central bank has gone to great pains to stress that this tool is separate from the bond-buying program. The jobless rate was 7.6% in June. Bernanke said the central bank will be in no rush to hike rates once the threshold is reached. “There will not be an automatic increase in interest rate when unemployment hits 6.5%,” Bernanke said in the question-and-answer session of a speech to economists. Given the weakness of the labor market, and low inflation “it may be well sometime after we hit 6.5% before rates reach any significant level,” Bernanke added. U.S. stock futures rose on the comments, with the S&P 500 (GLC:SPU3) contract tacking on about 0.7%.Read After Hours column for more markets coverage. The Fed chairman drew a clear distinction between asset purchases and rate hikes. The purpose of the asset purchases is to give the economy some forward momentum, Bernanke said. Ian Shepherdson, chief U.S. economist at Pantheon Macroeconomics, said he was sticking with his forecast of a September tapering after Bernanke spoke. Bernanke did make some fairly dovish comments. He also said that the unemployment rate probably understates the weak condition of the labor market. And he stressed that the Fed was concerned about the current very low inflation rate. If inflation does not move up closer to the central bank’s 2% target, “that would be a good reason to remain accommodative,” he said. Bernanke defended his decision to lay out a potential timetable for winding down asset purchases after the Fed’s last meeting. The Fed chairman said the central bank could start winding down its $85 billion a month bond-buying program later this year and end it altogether by mid-2014. “Notwithstanding some volatility that we’ve seen in the last six weeks, speaking now and explaining what we are doing might have avoided a much more difficult situation,” he said. If financial conditions tighten too much to jeopardize the Fed’s goals, “we would have to push back,” he said. At the moment, “with some luck,” positive factors will generate faster growth and labor market improvement through the rest of the year, he said. Bernanke spoke after the central bank released the minutes of the Fed’s last policy-making meeting. The minutes show a wide range of views among the central bankers on when to start to wind down the asset purchases. But about half of the Fed’s top 19 officials said it would be appropriate to end the asset purchase plan late this year. Federal Reserve officials expressed concern about how well the central bank was conveying its policy intentions to a jittery investing public, according to minutes from the most recent meeting. The June FOMC session was significant in that Chairman Ben Bernanke followed it by telling the media that the Fed was prepared to start winding down its bond-buying program by the end of 2013. That revelation, in a news conference, rattled markets, sending stocks on a 7 percent decline and interest rates surging higher. The minutes indicated a clear concern from committee members, who gave marching orders to Bernanke about what to say at the media gathering. “At the conclusion of the discussion, most participants thought that the Chairman, during his postmeeting press conference, should describe a likely path for asset purchases in coming quarters that was conditional on economic outcomes broadly in line with the Committee’s expectations,” the minutes said. Financial markets reacted strongly to the remark, triggering the worst performance for stocks all year. The minutes indicated an in-depth discussion about how financial markets were reacting to the quantitative easing measures, which entail $85 billion a month in purchases of Treasurys and mortgage-backed securities. FOMC members showed a strong inclination to orchestrate Bernanke’s comments to the media. The news conferences are a relatively new wrinkle in Fed policy during which the chairman addresses reporters at every other meeting. Members directed Bernanke to detail “a likely path” for a pullback in the asset purchases that would be dependent on economic data continuing to improve. In its economic review, the committee said growth is increasing at “a moderate pace,” language consistent with previous statements. There was some concern that higher mortgage rates would derail the housing recovery, but mostly agreement that things were continuing apace. _ By CNBC’s Jeff Cox. Flush with cash, Chinese homebuyers are flooding into the U.S. housing market, and paying top dollar. “The Chinese came out really huge in the past year,” said Jonathan Miller of Miller Samuel, a New York-based appraiser. Chinese buyers accounted for 18% of the $68.2 billion that foreigners spent on homes during the 12 months ended March 31, according to the National Association of Realtors. At a median price of $425,000, the Chinese are also buying more expensive homes than other foreign buyers, who spent a median of nearly $276,000 on U.S. homes. And nearly 70% of those pricey Chinese deals were made in all cash. Nowhere is the influx of Chinese homebuyers felt more strongly than in California, where more than half of the homes sold to foreign buyers went to Chinese nationals. Sally Forster Jones, an agent with Coldwell Banker International in Los Angeles, said Chinese are snapping up many of the trophy properties on the city’s Westside. She estimates that she’s sold about 10 multi-million dollar homes to Chinese nationals over the past 12 months. “The uptick in sales to Chinese buyers started several years ago but it has increased dramatically lately,” she said. Most of her Chinese clients are wealthy industrialists or real estate tycoons, many of whom spend less than half the year in the States. “Some have children going to school in Los Angeles and use the homes as residences for them and [as a place] to stay at when they visit their kids,” said Jones. China’s gross domestic product has grown by high single-digit, sometimes double-digit rates for the past 10 years, producing a lot of cash for the country’s top business people who view U.S. real estate as a safe and stable investment. Rick Turley supervises real estate offices for Coldwell Banker in eight counties in and around San Francisco, including Silicon Valley. Many of his Chinese clients work in technology. “The current hot spots are Palo Alto, Menlo Park and Cupertino, near Apple headquarters,” he said. Most purchase the homes to raise their family and they pay special attention to the local school systems. Turley also has Chinese clients who buy homes for their kids. Last year, a family from Shanghai bought a condo for their daughter who was attending Stanford. The daughter has since graduated and now works at Google, he said. Many Chinese buy homes through the U.S. government’s EB-5 Immigrant Investor program, which is considered a fast-track to getting a green card. To qualify, foreigners must invest at least $500,000 in a business that provides or preserves 10 jobs. This could be a home that is part of a bigger business project, such as a condo complex. Nearly 80% of all EB-5 visas went to Chinese nationals in 2012, according to the government. Beyond California, sunbelt states in general are attracting a lot of foreign attention these days. Post-housing-bust bargains in resort and retirement areas like Las Vegas and Naples, Fla. have have gotten buyers from Canada, for example. Four states accounted for 58% of all foreign sales. Florida had 23%, California 17% and Arizona and Texas 9% each. New York, an international business center and immigration gateway, and Virginia, close to the Washington corridors of power, both came in at 3%.